Welcome to Maine! 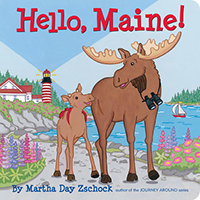 Parent and child moose tour Maine in best-selling author-illustrator Martha Day Zschock's Hello! board book series for children. In Hello, Maine! join the pair as they explore the rocky coastline to the heights of Katahdin—the highest mountain in the region. Along the way they visit lighthouses, see tidal pools, fish for lobsters, and dig for clams. They drive the coast in an old pickup truck, sail from island to island, and camp out under the stars. Little children and their parents will love this beautifully-illustrated view of Maine! For ages 2-5. Made in the USA.